Seriously, where does the time go? Again, another week has flown by. It seems like it was just Christmas, and now Easter is fast approaching. Like it's just a couple weeks away! How did this happen? It's not like I was sleeping and it it just passed on by, because let's face it, I'm not getting much sleep these days! It's just really hard to believe that a quarter of the year is already gone. The passing of time, has really nothing to do with these cookies, except that I made these a couple weeks ago back in January and it's almost April. I'm just in shock I think. Anyone else out there feel the same way? Or maybe time is standing still, and in that case you should bake these cookies to help pass the time :-) I have a favorite recipe for Cowboy Cookies that I've shared here before but when I saw this version on Let's Dish that included the addition of corn flakes I knew I had to try them. Mr. h bought a ginormous box of corn flakes awhile back and they seem to be multiplying in the dark corner of my pantry. I've eaten several bowls with milk, used them in Rustic Apple Pie, to coat chicken in and now these cookies and I still have some left. Somehow while making these, I knocked the bowl of cookie dough off the kitchen island and it fell to the ground and shattered all over the floor. 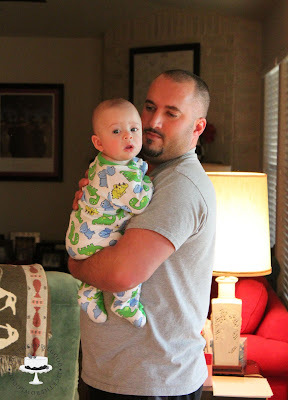 Hayden was in the other room but he, as curious as he is, had to come and see what was going on. Luckily, I had already portioned out most of the batter into balls so I didn't lose too much. The ones that I did bake, were delicious, especially when still warm from the oven. They were chewy, but crispy, and you could really taste the corn flakes when first baked. They next day the corn was more subtle but it definitely added a textural element to the cookies. 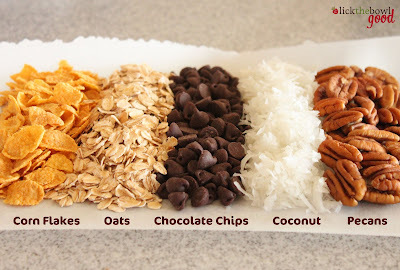 I think I'd like to experiment with my favorite Cowboy Cookie recipe that has cinnamon in it, by adding crushed corn flakes to it in addition to the coconut, pecans, oats and chocolate chips. yum! Cream together the butter and sugars until light and fluffy. Add the milk, vanilla and eggs and beat well. Stir in cornflake crumbs and oatmeal. Add the flour, baking soda and salt and mix. 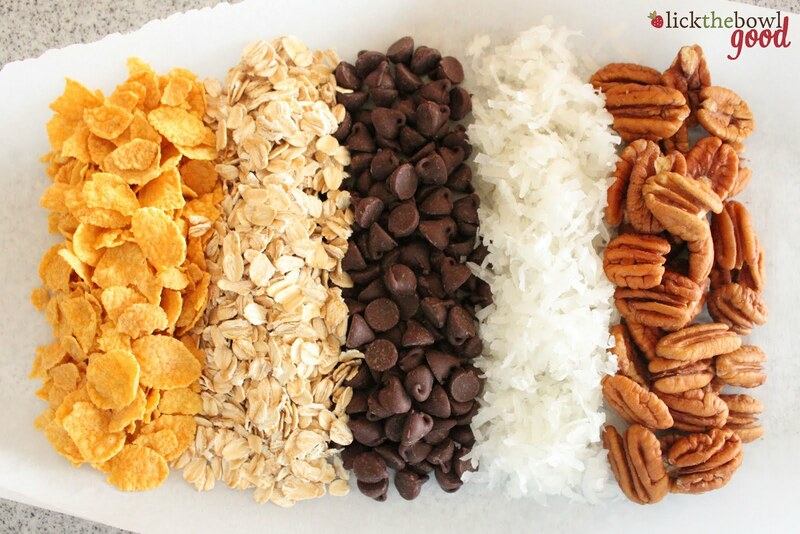 Stir in the coconut, nuts, if using, and chocolate chips. Oh my gaugh! I haven't made Cowboy Cookies in YEARS! 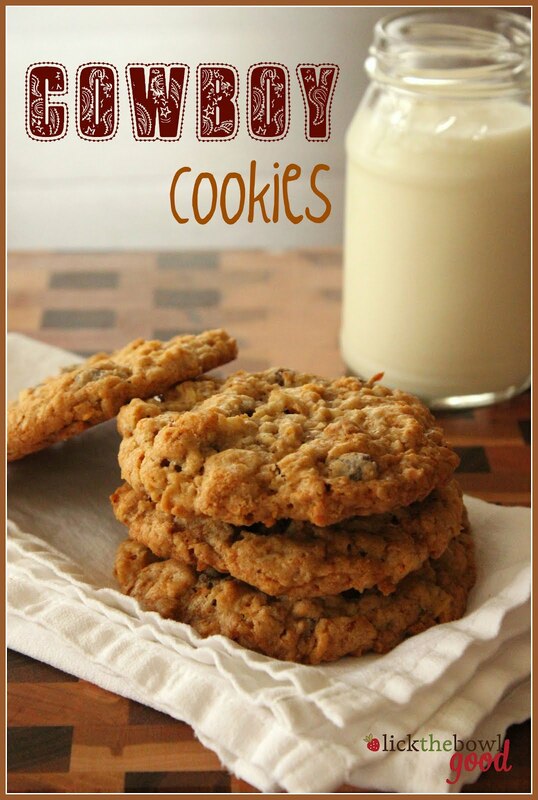 I am actually quite shocked that you haven't had cowboy cookies with cornflakes! I have grown up believing that cornflakes were a critical ingredient in cowboy cookies! 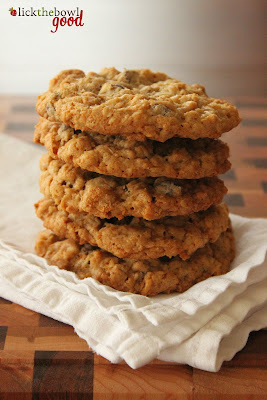 I think I am going to go make time pass and make the cookies to reminisce about my childhood! Love the sound of all those add-ins. Looks a delicious thick and chewy cookie. Hayden seems to get cuter by the day! I always buy the big box of corn flakes, and they last forever! I mostly use them for baked chicken, but I've always been curious about having them in cookies. Hope you guys are well! We'll have to catch up soon! I now have a crawler who is trying to stand up and cruise the couch. TOO SOON. I always thought that I'd have more time to myself when my baby boy grew up. Ha! I have no idea where the time goes, but I wish it'd slow down. I love cowboy cookies. 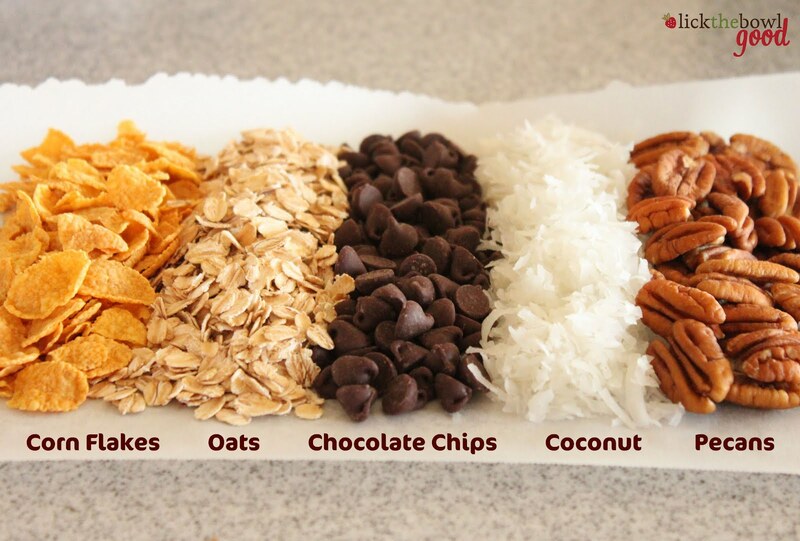 The corn flake thing sounds interesting. 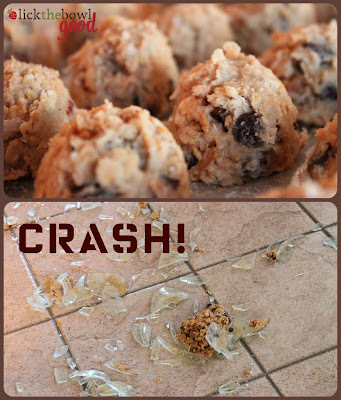 Uh-oh on the broken glass and dough! Yikes! Good thing you had scooped out most of the cookies. Looks wonderful and boy oh boy is Hayden getting big!! You are so lucky! Your little guy is so handsome. Seriously one of the cutest babes I have ever seen. Thank for all the wonderful recipes! Just found your blog and am LOVING it. These cookies look great! I made these last night... to die for! I made them without modifications, but I put them in bar form in a 9x13 and 8x8. However, I am going through a giant crust phase, so I slapped a crust on the 9x13 bars made of oreos and cinnamon teddy grahams, and some salt. They're amazing both with and without the crust. I love this blog so much. It's my very favorite go-to. I'm going to be like you when I "grow up", hehe! These are SOOO intriguing! I can't wait to try them! Thru a long domino effect of delicious recipes, I seen the recipe for cowboy cookies so i had to check that out too =] My husband's 2 outta 3 favorite things are pecans, and Dallas Cowboys =] I'm sooooo gonna have to make these for him and tell him I even got the recipe from another fan <3 Probably gonna surprise him with some pepperoni puffs too. Spoiled hubby. But then Mommy is makin the lime curd cheesecake! Made these tonight. 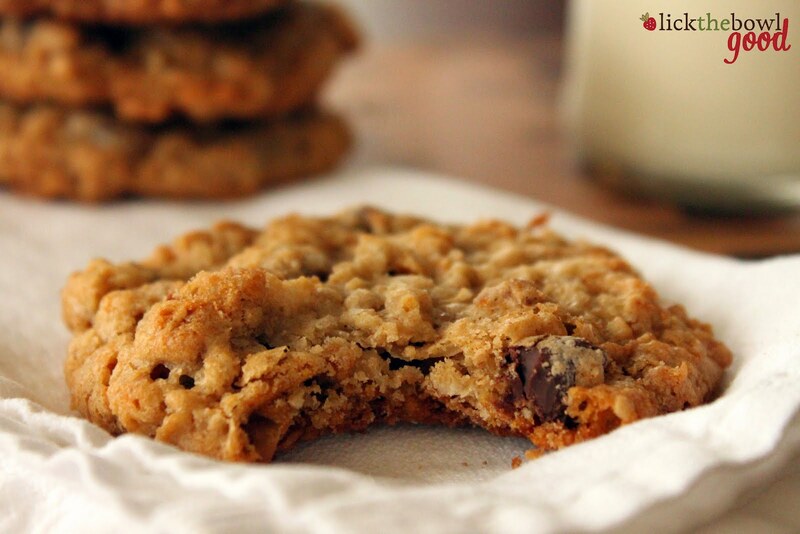 I suggest using only half the salt and substitute a cup of flour for a cup of oats. Also butterscotch chips taste awesome in these.